The Coat of Arms of the United States: A coat of arms is the official mark and emblem of a sovereign nation’s authority. The Coat of Arms of the United States contains an American Bald Eagle, clutching an olive branch in his right (dexter) talon, and a bundle of thirteen arrows in his left (sinister) talon. On the breast of the eagle is a shield with thirteen vertical white and red stripes, beneath a blue chief. In his beak is a scroll inscribed with the motto “E Pluribus Unum” (Out of many, one). Over the head of the eagle, a golden glory is breaking through a cloud, and surrounds a constellation of thirteen stars on an azure field. The Coat of Arms was meant to symbolize the beliefs and values of the founding fathers and the new nation. The red and white stripes of the shield represent the states united under and supporting the blue, representing the Chief and Congress. White symbolizes purity and innocence, red signifies hardiness and valor, and blue represents vigilance, perseverance, and justice. The shield is supported solely by the American eagle to denote that Americans should rely on their own virtue. The number 13, symbolic of the 13 original colonies, is displayed in the bundle of arrows, the stripes of the shield, and the stars in the constellation. The olive branch and the arrows display the power of peace and war. A new nation taking its place among established, sovereign states is represented by the constellation of stars. The motto E Pluribus Unum expresses the union of the 13 states. “The Secretary of the United States in Congress assembled to whom were referred the several reports of committees on the device for a great seal, to take order, reports: That the Device for an Armorial Achievement & Reverse of the great seal of the United States in Congress assembled is as follows – Arms: Paleways of thirteen pieces Argent and Gules: a Chief, Azure. 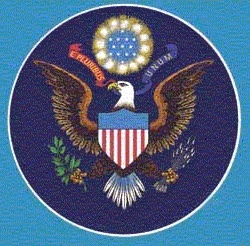 The Escutcheon on the breast of the American bald Eagle displayed, proper, holding in his dexter talon an Olive branch, and in his sinister a bundle of thirteen arrows, all proper, & in his beak a scroll, inscribed with this Motto; ‘E pluribus unum’ – For the Crest: Over the head of the Eagle which appears above the Escutcheon, A Glory, Or, breaking through a cloud, proper, & surrounding thirteen stars forming a Constellation, Argent, on an Azure field”. “The Escutcheon [shield] is composed of the chief & pale, the two most honorable ordinaries. The Pieces, paly, represent the several states all joined in one solid compact entire, supporting a Chief, which unites the whole & represents Congress. The Motto alludes to this union. The pales in the arms are kept closely united by the chief and the Chief depends upon that union & the strength resulting from it for its support, to denote the Confederacy of the United States of America & the preservation of their union through Congress. The colours of the pales are those used in the flag of the United States of America; White signifies purity and innocence, Red, hardiness & valor, and Blue, the colour of the Chief signifies vigilance, perseverance & justice. The Olive branch and arrows denote the power of peace & war which is exclusively vested in Congress. The Constellation denotes a new State taking its place and rank among other sovereign powers. The Escutcheon is born on the breast of an American Eagle without any other supporters to denote that the United States of America ought to rely on their own Virtue”.